In the 19th century diphtheria, which is passed on by airborne infection, was one of the “major killers” of children (Süß 2003: 215). Emil von Behring developed a vaccine against the epidemic disease which, however, was initially expensive and unreliable. In the 1920s, the last big wave of the disease came in bouts and appeared in regional epidemic centers from Scandinavia to Germany. About 30,000 people were afflicted in 1926, about 150,000 in 1938 and about 300,000 in 1943. The Second World War favored the spread, since the defenses of the population were weak and many people were often crowded in small rooms, such as air raid shelters. In Frankfurt am Main the numbers of 783 diphtheria patients in 1930 and 1,703 in 1940 represented the peak of the disease. According to statistics, 50 diseased died in 1930 and at least 64 in 1940. In 1948 the Hanau physician Friedrich Blendin described different factors which influenced diphtheria in Frankfurt am Main. He found no great difference in disease incidence determined by gender. From the seasonal point of view, Blendin could register a considerable increase of cases in late autumn and winter which could be due to gathering because of the low temperatures or an increased virulence of the pathogenic agents. Regarding the statistical distribution in age groups, Blendin determined that in the years 1925 to 1927 infants aged between 0 and 5 years made up about one third of the cases and, consequently, represented the largest proportion of the diseased. After that, the largest group affected by the disease was the 5- to 10-year olds. There were various actions to combat epidemics of which the most important was isolation. In 1899 the Straßburg scientists Ernst Levy and Sidney Wolf pointed out that, even in the Hebrew Bible, the Mosaic Law called for the isolation of persons with infectious diseases. Robert Koch described the isolation of diseased and family members who were suspected of being ill or hospital patients as “the best and most effective weapon in the fight against infectious diseases” (Süß 2003: 217). The Law on Infectious Diseases of the German Reich of 30th June 1900 legally required the confinement to isolation which signified an infringement of personal freedom. The need for isolation was taken into account when erecting new buildings within the Jewish hospital system. In 1914 the hospital of the Jewish Frankfurt am Main community on Königswarter Strasse had become too small so that a bigger hospital complex was built on Gagernstrasse. The new hospital had its own infection building for its patients. It formed a semi-circle, had a bed hall on the ground floor situated in front and “verandas like day rooms” (Hanauer 1914: 65) on the upper floor of the bed hall. Separate lock systems were set up as entrances for physicians and patients. Each of the four departments of the infection building had a nurses´ station with a special bathroom and further side rooms, such as a small kitchen, toilet, children´s toilet and sink. The doors had flaps through which it was possible to observe the patients without having to enter the rooms. The walls were painted with oil paint or limed to make cleaning as easy as possible. Dirty laundry could slide through a tube system into disinfectant solution. There was also a small laboratory (cp. Hanauer 1914). 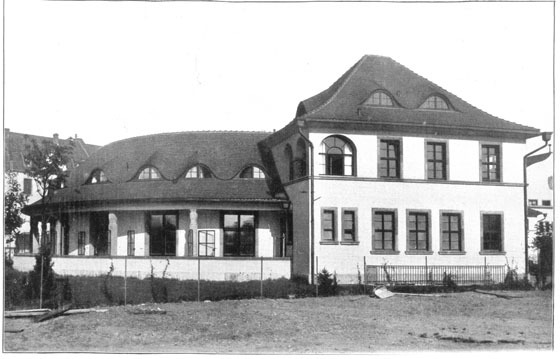 Also in 1914 the Frankfurt association for Jewish nurses erected a new nurses´ home on Bornheimer Landwehr next to the hospital where two separate rooms had been set up to meet the requirements of isolation of the nursing staff. Each of the rooms was provided with its own gas stove, bathroom, toilet and house phone. This was how the risk of infection for the other nurses was controlled, and the nurses who were carng for the isolation department remained undisturbed in their working patterns. 1Still today the immunoglobulins, which are necessary for the treatment of diphtheria, are extracted from horse serum as source material.